Blizzard is preparing for a significant legal battle in Korea over the television broadcasting rights for StarCraft. StarCraft is so big in Korea that it's comparable to baseball, football, or soccer in other regions. The best players become big stars, and the game's tournaments are often broadcast on television. These sorts of broadcasts are a-ok with Blizzard, just as long as the television networks have its permission, which some of them recently do not. Blizzard says that it plans to take these networks to court. Blizzard currently has an exclusive partnership with Korea's Gretech-GomTV for the broadcast and operation of StarCraft tournaments on television, which also grants GomTV the ability to negotiate television deals with other Korean networks. However, networks such as MBC Game and OnGameNet have been televising their own StarCraft tournaments, organized by the Korea e-Sports Players Association (KeSPA), which are not sanctioned by Blizzard. KeSPA claims that StarCraft is public domain. Blizzard once had a partnership with KeSPA, but cut ties after KeSPA sold StarCraft television rights to other companies without its permission and the two couldn't negotiate a new deal. Blizzard now promises to bring MBC Game and OnGameNet to court, and is also considering litigation against KeSPA. The two networks were allowed to finish broadcasting the previous StarCraft season, but have continued to televise tournaments since then against Blizzard's wishes. "It's unfortunate that the e-sports industry in Korea is lagging behind other industries in recognition of intellectual property (IP) rights and the basic principles related to them," Blizzard COO Paul Sams told journalists in Seoul. "Korea is the only region in the world where we have had to resort to litigation to protect our IP rights." Blizzard believes that it deserves to collect licensing fees for televised StarCraft tournaments to both protect its rights and to give it incentive to continue to balance the game. 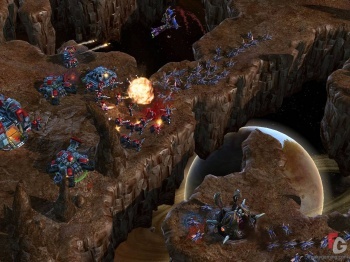 "Classifying StarCraft and other e-sports as part of the public domain deprives developers such as Blizzard of their IP rights," Sams added. "There will be no incentive to do what Blizzard had done to balance the games for competition, which is a more difficult task than creating a normal game." GomTV offers 12-month StarCraft television contracts for 100 million won ($86,800) per league. Sams calls MBC Game and OnGameNet "hypocrites" for complaining about this deal, which costs around 20% of what KeSPA charged when it illegally sold StarCraft's television rights. Blizzard doesn't necessarily care about profit in this case, and only wants to protect its IP just as the NFL, MLB, and other organizations vehemently do.